I hope everyone has been able to tolerate this heat. While today is beautiful, it sure has been too hot for me outside. So, my plan is just to stay in the AC and sew, sew, sew. You should come in and see our new samples! All of us have been busy! New fun projects, new classes and our new Strippin Night. If you want in on that class, do it quick. We had quite a few registered when we only posted it on Facebook. Be sure to follow us there. 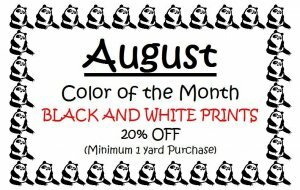 We are always posting new items as they come in and our new classes will show up there before you might see them in a newsletter. I hope everyone is enjoying their summer vacation, mine is coming up soon and I am really looking forward to it! Stay cool and keep your Bobbins Hoppin! Kelly and of course Tootsie too! Row by Row 2017 started on June 21st! 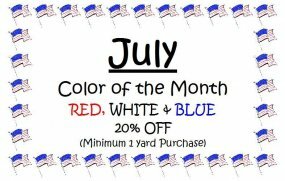 Make sure you come by Hoppin Bobbin to get your FREE pattern between June 21st and September 5th. Theme this year is On the Go! We kept our snowman theme this year, "Sled Row"and our snowman is "On the Go!" with his sled. Kits are available and of course your Free Pattern when you stop by to visit us! Also, check out our Let It Snow Quilt while you are here! 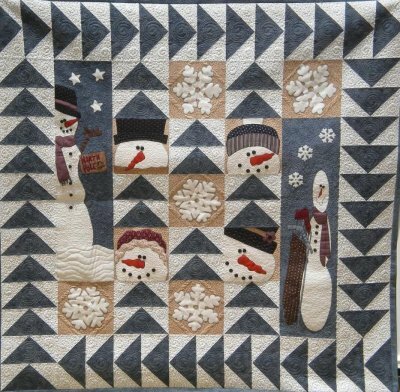 This quilt combines 3 years of Row x Row snowmen and full patterns and kits are available. Snuggle up with this one this winter! This easy machine applique wall hanging will make you smile every time you look at it! Never done applique or just love it? Look what you can accomplish in a few hours. 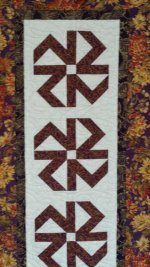 Our focus will be on the center, with an overview on finishing the border and quilting. 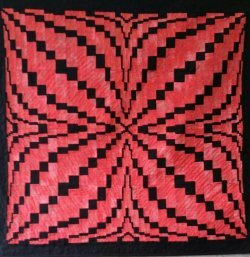 This project is approximately 38" square, large enough to give you a taste of a Bargello, but small enough to get through in two classes. Choose your favorite Butterfly colors and make this beautiful Bargello wall hanging, once you’ve done it you’ll want to do more. The book is packed full of wonderful easy, well written Bargello patterns. 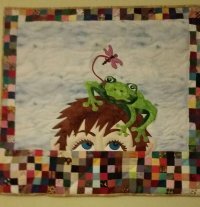 So if you are a new or experienced quilter this project will be fun! This colorful quilt is all strips, come to class with your strips cut and be ready to quickly piece this two block quilt. 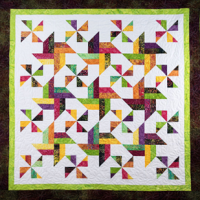 You’ll get tips and tricks that will make all the rest of your strip quilts a breeze, all your seams will meet and lock and the result will make you proud! So come join this strippy class with your favorite fabric choice and let’s get stripping!! Beginner "Sewcial" is Thursday, October 19th. Bring your quilt and a dish to share. This elegant table runner can be made is so many different combinations, make it for the holidays or every day, to match your decor or as a gift, lots of options. One block with a different look, easy and fun you might want to make one for everyone on your gift list this year! Come join us in making this runner in just a few hours. Looks difficult but easy enough for a beginner once you know the tricks. 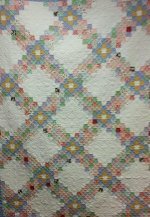 Just a reminder that our quilting cutoff date for Quilts to be returned for Christmas is November 1st. So, get those quilts done so you have plenty of time to do that dreaded binding!